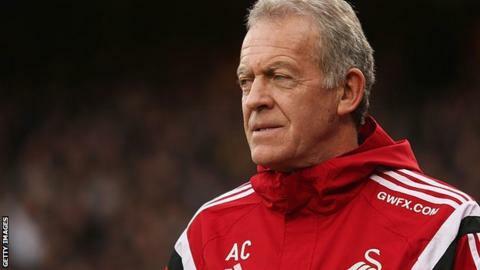 Swansea City have identified their targets for the January transfer window, says caretaker manager Alan Curtis. The Swans, who are two points above the Premier League relegation zone, sacked former boss Garry Monk on 9 December. Curtis, 61, is happy to stay at the helm until Swansea find a permanent successor and says plans are in place for January signings. "There are funds available," said Curtis. "I think the targets are probably the same targets we were talking about a couple of months ago. "[Chairman] Huw [Jenkins] and our scouts are in charge of that operation. I won't have a say in it but I'll know shortly who are those targets." One player who does not seem to be heading to the Liberty Stadium is Chelsea striker Patrick Bamford, who opted for an early termination of his loan spell at Crystal Palace. "Patrick's a good player but I don't think there have been any enquiries to bring him in to the club," said Curtis. While Swansea have earmarked potential signings for January, the club's striker Bafetimbi Gomis and midfielder Jonjo Shelvey have been linked with moves away from south Wales. Gomis is reportedly a target for Qatari club Lekhwiya, while Crystal Palace and Newcastle have been touted as potential suitors for Shelvey. Asked if Gomis would still be at Swansea once the January window closes, Curtis said: "I hope he will be. As far as I'm aware, nothing is going on, only a little bit of speculation. "Certainly the chairman hasn't mentioned that to me, players going. As far as I'm aware, there have been none [enquiries for Gomis]. On Shelvey, Curtis added: "Again, nothing as far as I'm aware. There's a lot of speculation about Jonjo but there's going to be - he's out of the side at the moment." Swansea's search for a new manager has seen chairman Jenkins travel to South America to hold talks with former Argentina and Chile boss Marcelo Bielsa. Roberto Di Matteo and AEK Athens boss Gus Poyet have also been linked with the post, but Curtis is set to take charge of his fifth game when Swansea visit Manchester United on Saturday. The former Wales forward could stay in the role until the end of the season and, however long he may be at the helm, Curtis is content. "We're in the same position. We carry on regardless. I did speak with Huw yesterday and I think the search goes on. The important thing is to get the right one," he said. "I'm quite comfortable in the situation which we find ourselves in at the moment, which is almost on a day-by-day basis. "Things could change, even this week, probably highly unlikely but I don't need any statement [on his future] at all. "We're just doing what we're paid to do really, which is to prepare the team for the weekend. We carry on doing that until the situation changes."